RSVP Press Proudly Presents . . .
New Version - Fully Updated. Now Includes the Version for Mac users, too! Polymer clay is a lively, colorful medium - and this is a lively colorful book! A Unique, Beautifully designed and Illustrated Multimedia Book on CD-Rom. Easy to start, read and navigate interactively via the Internet! Polymer Clay Artist's Interactive Guide to the Internet includes Hundreds of Illustrations - Photographs of Polymer Clay Artworks and other creations: Sculptures, Jewelry, Dolls, Figures, Home Décor, and Lots More! Wonderful artworks by the Featured Artists and many other talented polymer clay artists and craftspeople. A great guide to what is going on in polymer clay today! 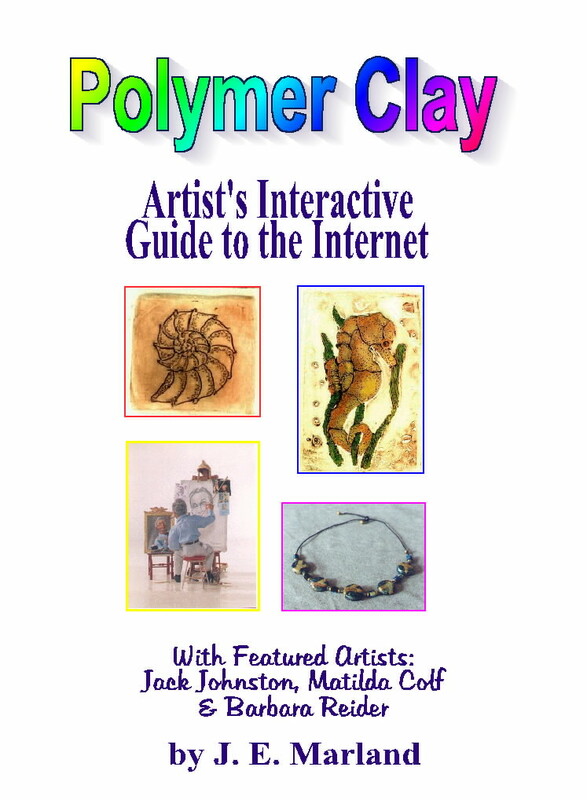 The first guide of its kind for polymer clayers on the Internet, this Interactive Guide brings all aspects of the polymer clay together as never before! Why spend days, weeks and months searching for polymer clay websites online when you can have all the best right at your fingertips whenever you want or need them? Polymer Clay Artist's Interactive Guide to the Internet features over 1000 polymer clay-related websites. Helps eliminate annoying and time-consuming inactive websites, and this guide also eliminates webpages "masquerading" as polymer clay websites. In addition, the Guide minimizes web advertising - especially the annoying "pop-up" ads. Over 1000 Polymer Clay-related websites! Links to everything Polymer Clay on the Internet - like having all your favorite polymer clay websites in one place - plus lots more! All the popular polymer clay websites plus lesser and little known sites. Polymer Clay Artist's Interactive Guide to the Internet features more than 1000 polymer clay-related websites, with minimal repetition of websites in categories and websites listed alphabetically whenever possible to make finding websites easy. Please note: No actual webpages appear in the book - only the links (website addresses). Unique software used to create this book allows the reader to literally surf the Internet browsing polymer clay-related websites. Reader must have access to Internet service: AOL, Net Zero, or other online service provider to browse the Internet through this book. Plus: Online Polymer Clay Glossaries and Encyclopedias. And Much Much More! Links to everything Polymer Clay on the Internet! Artist's Webpages: Hundreds of Artist's Webpages featuring Polymer Clay Artworks and Creations, Workshops, Craft Projects, Artworks for Purchase, and Much More! How To & Instruction for Polymer Clay - Beginners to Advanced. Craft Projects - Polymer Clay Craft Projects for all skill levels: from Beginner to Intermediate to Advanced. Projects for Dolls, Jewelry, Vessels, Sculpture, Miniatures, Appliques, Flowers, and Much More! Online Polymer Clay Glossaries and Encyclopedias. Miniatures: Craft Projects and Websites for Miniatures of all kinds: Dollhouse Furnishings, and More! Precious Metal Clay: Information, Craft Projects, Artworks and Jewelry about this new and popular clay medium. Buying Polymer Clay: Artworks, Dolls, Gifts, Jewelry, Miniatures, Home Decor, And More! Publications: Magazines and other publications about polymer clay exclusively or that feature polymer clay periodically. Resources: Websites that offer valuable information on polymer clay. Supplies: Sources for polymer clay and all the newest polymer clay tools and other supplies. From trimmers to molds to rubber stamps, it's all here. Swaps: Current and completed polymer clay swaps for jewelry, ornaments and other art works. Webrings, Bulletin Boards and Newsgroups for polymer clay and polymer clay-related topics.Plus: Gallery Pages: Both Online and in the Book featuring Hundreds of Polymer Clay Artworks: Sculpture, Boxes, Dolls, Jewelry, Vessels, Figures, and Much Much More! On Windows 95/98 and ME compatible CD-Rom. CD also includes the version for Mac users. has several books in the works.